This article on Risk Arbitrage Investing was written by Jack Lyons. Jack has worked as an equity analyst and auditor in Dublin, Ireland. He focuses on applying a quantitative net net and Acquirer's Multiple strategy in his personal account. Article image (Creative Commons) by Nick Youngson, edited by Broken Leg Investing. Many people categorize value investing as simply investing in net net or acquirer’s multiple stocks — the truth is that value investing is far broader than these narrow definitions. As Klarman suggests, risk arbitrage investing can be thought of as a separate branch of value investing. While the majority of value investing strategies are based on long-term, buy-and-hold fundamentals, risk arbitrage investing does not depend on these basics. Because there is a predefined execution date for a merger, there is a natural catalyst already built into this strategy. Of course, the inclusion of the word “risk” in the title “risk arbitrage investing” highlights the point that the opportunity to make money from the strategy is by no means guaranteed. As with any type of investment strategy, the risk of failure exists. This makes risk arbitrage investing distinct from a true arbitrage situation, whereby profit can be made with zero risk. Such opportunities rarely arise in investing, and risk arbitrage investing should not be mistaken for a strategy that provides guaranteed returns. Risk arbitrage investing is an extremely specialized form of value investing. The point of the strategy is that following the announcement of a merger or acquisition, the acquiree’s share price tends to immediately increase to a level within a few percentage points of the acquisition price. However — and key to this strategy — the price of the acquiree will rarely move up all the way to the full price to be paid by the acquirer for each share. This leaves a “spread” between the current price of the stock and the price to be paid by the acquirer, should the event take place. Usually, the price will move to somewhere between 90%-95% of the proposed deal price. This leaves the risk arbitrage investor with the opportunity to purchase the stock at this point and make the remaining 5%-10%. By being able to differentiate between an ultimately successful and unsuccessful future merger, a risk arb investor can potentially make excellent returns. 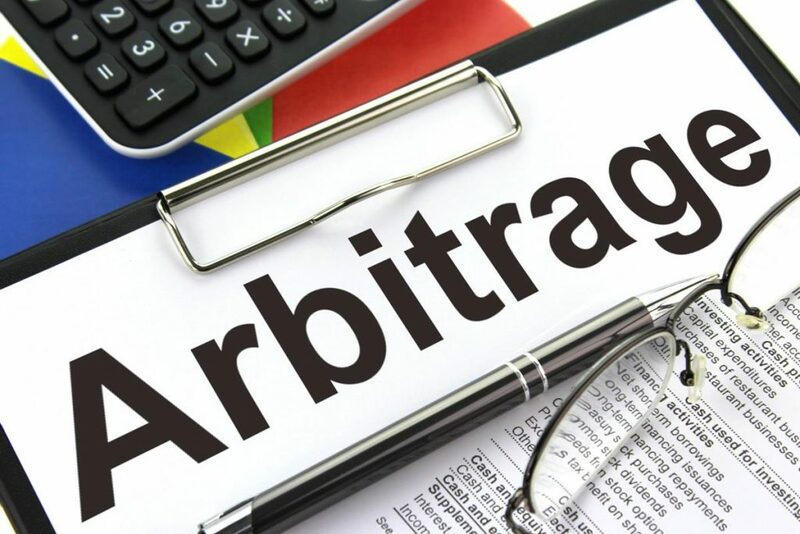 In addition to this, because the merger is unrelated to the day-to-day movements of the stock market, risk arbitrage investing is uncorrelated with stock market movements. This makes the strategy an excellent form of diversification within a portfolio. Company B has a share price of $5. Company A announces that A & B have agreed on a merger whereby A will buy B for $10 per share. Company B’s share price immediately jumps on the news to $9 per share — the price does not move all the way to $10, as the market perceives there is a small risk that the merger won’t ultimately take place. At this point, Mr. Arb, a risk arbitrage enthusiast, purchases the share at $9, in the hope that he can sell it for $10 once Company B pays up for the shares. “The December 1987 takeover of Becor Western Inc. by B-E Holdings Inc. fits this description. In June 1987 Becor sold its aerospace business for $109.3 million cash. This left the company with $185 million in cash (over $11 per share) and only $30 million in debt. The company also operated an unprofitable but asset-rich mining machinery business under the Bucyrus-Erie name. 0.6 warrants to buy common stock in B-E Holdings at $.01 per share. 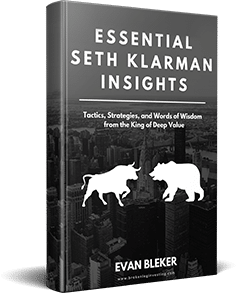 While the company in the example provided by Klarman was significantly undervalued by other methods of valuation, this will often not be the case when researching companies as part of a risk arbitrage investing strategy. Risk arbitrage investing can — and should — be thought of as a stand-alone strategy. While, of course, it is advantageous for a stock to be desirable from more than one perspective — for example, a company is subject to an impending takeover, while also being a net net — the two strategies are very different and need not be considered together. With this example, Klarman identified a merger arbitrage opportunity with a very wide spread. Often, this can be the case when the market believes that there is very little chance of the merger going ahead. However, and what seems to have been the case in this stage, a general depression in stock prices at the time had also caused a decrease in Becor Western Inc.’s share price. Of course, when a company is in the midst of being acquired, it would seem irrational to think that market movements should affect its share price. However, as we well know, the market is not always a rational machine, and when it provides us with free money, we should accept it. As Klarman says, the tendency for investors to avoid what they don’t understand leaves an opportunity for value investors who do their homework. While risk arbitrage investing is not the most straightforward of strategies, it is by no means impossible to master. And, as Klarman points out, the fact that investors often do not engage in the strategy makes opportunities in the area timeless. The fact that many investors choose not to engage with the strategy, like with many other types of value strategies, means that money is being left on the table by the market. This alone makes the strategy at least worth investigating. 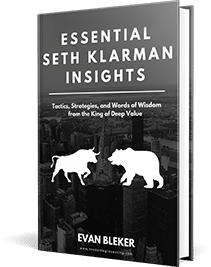 This entry was posted in Value Investing Essentials and tagged arbitrag, margin of safety, Risk Arbitrage, Seth Klarman, value investing. Bookmark the permalink.